It's simply that some people no longer even pretend that they think your time is as important as theirs. And technology makes it worse. It seems texting or emailing that you are late somehow means you are no longer late. Rubbish. You are rude. And inconsiderate. But while the behavior of keeping someone waiting on you is, decidedly, rude, it doesn't necessarily mean your tardy friend is doing it on purpose, or that he or she is a rude, inconsiderate person -- in fact, there are several psychological and perhaps even physiological components that can contribute to being perpetually late. "Lateness is really a commonly misunderstood problem," says Diana DeLonzor, author of Never Be Late Again, who has conducted her own research on the perpetually tardy. "Yes, it's a rude act, but I've interviewed hundreds of people and the vast majority of late people really dislike being late, they try to be on time, but this is something that has plagued them throughout their lives. Telling a chronic late person to be on time is like telling a dieter, 'Don't eat so much.'" And it's often a problem that begins early. "[For many] it started in childhood, and they're late for not only things that have to do with other people, but things that will only hurt themselves," DeLonzor tells HuffPost. They'll show up to the gym, for instance, 10 minutes before it closes, or they'll be late for job interviews. "One of the things I found is that some people were subconsciously drawn to the adrenaline rush of that last minute sprint to the finish line ... They have a hard time motivating themselves without that looming deadline, without that crisis on the horizon," she says. "Then, as they realize there's no way they're going to make it on time, that positive feeling turns to dread. Then they start beating themselves up." The second category of late people is what DeLonzor has dubbed "the producer." "Those are people who consistently over-schedule their days," she says. "[The producer] thinks she can go for a run, clean the house, put in a load of laundry, pick up the dry cleaning, take a shower and get the kids dropped off at school in an hour." The third group is what she calls "absent minded professors," which are easily distracted people who might even have a diagnosable condition in the form of attention deficit hyperactivity disorder. "When they head out the door, they might notice the drapes are crooked and they run over and fix the drapes. On the way back they'll get distracted by seeing the computer is on and they go to turn it off but have to surf the web first," she says. "They have a hard time getting from point a to point be without getting distracted by c, d and e."
A fourth, less common sub-type, is what DeLonzor calls the "rebel," or a person who actually enjoys being late, because they like the idea of knowing other people are waiting for them. "They're maybe people who are insecure and having people wait for them makes them feel important," she says. While the first three categories are the most common, the other groups include "the rationalizer," who doesn't fully admit the problem and always blames it on external factors (a traffic jam! ), "the indulger," who struggles with self control (I don't feel like going!) and "the evader," who keeps trying to perfect a situation before leaving the house (one more outfit option!). 1. Reevaluate how long your routines really take. Late people tend to remember the one time they got ready in 20 minutes or the one time they got to work in seven, instead of realizing that most days it takes them 40 minutes or 15. DeLonzor recommends writing down your daily habits and then estimating how long you think it takes you to do each one -- then spend a week or so writing down how long each thing actually takes. "Late people tend to engage in magical thinking," she says. It's time to relearn how to tell time. 2. Change your thoughts, not just your behavior. 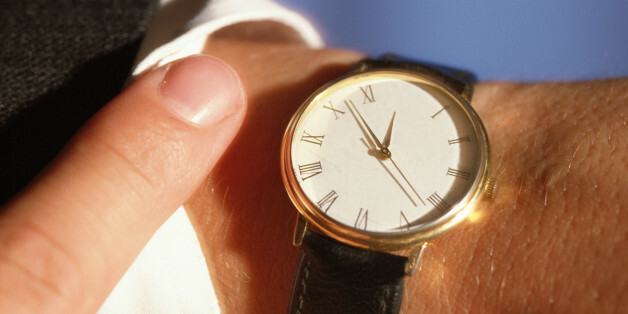 Reframing the way you think about punctuality can be an effective cognitive trick. Instead of stressing about it, sit down with a pen and paper (when you're not in a rush) and jot down all the positives that come with being on time, suggests Teri Bourdeau, Ph.D., a clinical associate professor of behavioral sciences at Oklahoma State University. You might write, for example, that being timely will make you look more responsible, or that it will stir up less conflict with co-workers. Think about the things that are going to motivate you to be on time, and remember them the next time you're trying to cram in too much before a deadline. 3. Get down with downtime. Eternally tardy people, particularly those who fall into the "producer" category described above, often like to pack in as many activities as possible to maximize productivity, which can make any extra waiting time uncomfortable. One option for coping is to plan out an activity you can do when spare minutes creep up, whether it's catching up on work emails on your iPad or calling a parent you haven't had a chance to catch up with. But another option is to reframe downtime as something to enjoy between all the rushing -- luxury time instead of wasted time. "A big part of the enjoyment of life is just sitting back and talking to the person next to you or looking at the sky or smelling roses," DeLonzor says. 4. Budget your time differently. Timely people will give themselves round numbers to get somewhere -- 30 minutes, for instance. The chronically late, on the other hand, often budget exact times, like 23 minutes, to get somewhere, a habit that DeLonzor calls "split second timing," which doesn't account for the inevitable delay factors that pop up. "If you're exactly on time, that means you engaged in split second timing," she says. "You should not consider yourself on time unless you're 15 minutes early." 5. Reschedule your day. "Habits tend to be reflexive patterns of behavior and what we need to do is change that pattern," Bourdeau says. Start writing appointments down 30 minutes before they actually happen, which will help you start planning before the last second. And reevaluate your to-do list -- chances are, you're simply not going to get everything done. Bourdeau suggests splitting things into categories: what you absolutely must do, and what has a negotiable timeline. Try crossing a few of the latter off the list, or move them to a time when you're less harried. And be sure to schedule in downtime every day so you know when it's time to relax, and when it's time to get moving.